Chirihama Beach Drive Way(千里浜なぎさドライブウェイ) is located in Hakui City, Ishikawa Prefecture. It is 8km long beach with great view of the Sea of Japan. This is the only beach where you can drive your car. Driving on the beach and see the great sea of Japan is fantastic. You can enjoy a great Sunset into the Sea of Japan. There are many temporary Bar and Grill that you can have fresh seafood. Chirihama Nagisa Drive Way is 8km long beach located from Hodatsuhimizu Town to Hakui City, Ishikawa Prefecture. You can see the great view of the Sea of Japan. The main feature of this beach is that you can drive your car. 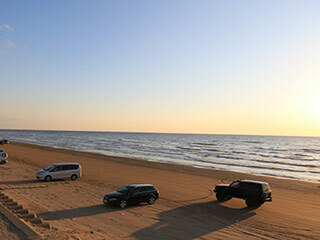 There are only three public beaches where you can drive just by the sea in the world, and Chirihama is one of them. Because the sands of the beach is very small comparing with the other beach-sands in Japan. There for the beach can become so tight by car. That's why you can drive your car here. In summer, this beach is also popular for Sea bathing. It has a great Sunset of the Sea of Japan.